What do you do with leftover BBQ chicken wings? Well,usually we just eat as it's the next day. But this time I modified my leftover honey bbq chicken wing with five spices with some spicy sauce and make another dish for my dinner. 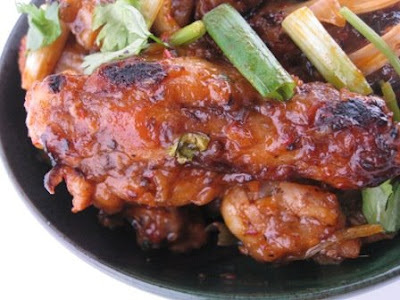 Check out my honey bbq chicken wing with five spices HERE!! .It's taste better and I love it! 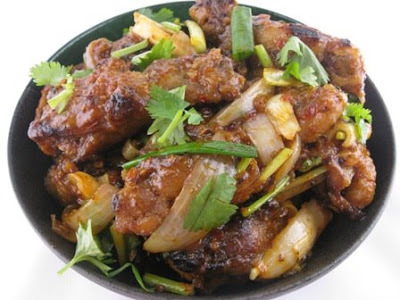 I think leftover food taste better the next day..Anyway,I'm a freak for spicy food,so it's doesn't really matter..If you have any left overfood chicken wings don't keep re-fry again and again.The meat will become hard and dry . Try to add some sauce and relived the dish again to a new dish..
1:Heat skillet with oil at medium high heat,add in chopped garlic,fry for 30 second,then add in spicy sauce,sugar,salt and water. 2:When the sauce is bubbly boil,add in leftover BBQ wings.Keep stirring until wings coated well with spicy sauce.Then add in onion ,stir about 6-7 times,before shut off the heat.Then sprinkle with some cut scallion and cilantro. 3: Dish out and serve warm. Looks so delicious! Can I have some pls? The last time when I checked your chicken wing recipe, I was hungry.... and no exception this time!!! It sure looks delicious! I for one loved to use the leftover to create another yummy dish. hmm. YUM !! YUM !!! yeah, agree .. don't just re- fry the leftover chicken wings !! Love ur recipe..i can imagine when the chicken wings absorb all the sauce.. yummy !! 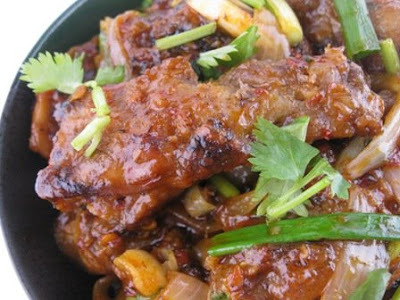 I know you love to cook leftover food,don't we all chinese live in US do that? yes,as long as it's spicy,right?